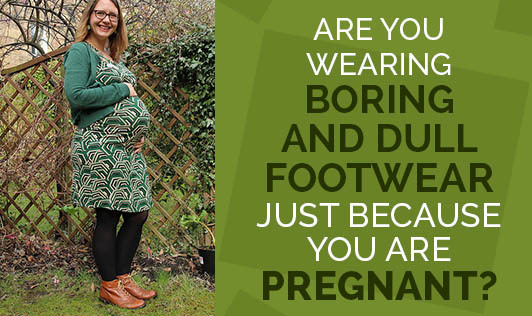 Are You Wearing Boring And Dull Footwear Just Because You Are Pregnant? It may become a temptation to keep your same old shoes through your pregnancy; however that should not be a common practice. While most women won't notice a change until later in their pregnancy, it is important to keep a constant tab on your foot health. This is especially true when your baby bump becomes larger, and begins to put more pressure on your lower back. Are High Heels allowed during pregnancy? The main reason why high heels are better avoided during pregnancy is that high heels especially pencil heels fail to support the feet properly and your feet can twist. This can cause you a muscle pull or a sprain. Also, you may experience a burning sensation in your feet because of the excess strain. There is also a possibility that you may lose your balance because of lack of proper support and you may trip and have a nasty fall. If you fall while you are pregnant, you may injure your baby. The other disadvantage of wearing high-heeled shoes is that there is already lot of stress on your back in pregnancy. When you wear high heels, your whole foot is raised as compared to the normal level and there is added stress on your back. This will lead to pain in your back. So, if you are uncomfortable wearing flat footwear, you can opt for heels which are sturdy like platform heels. You can wear heels which are up to two inches high. While you are pregnant, you may have swollen feet because of water retention. In such cases, you need to wear foot wear which has a broad section for your toes, so that they have room to move. Also make sure that you do not go for the big toe support. If you buy one with the support then your feet may not fit in the footwear when it is swollen. Just as you wear loose clothing during pregnancy, make sure that you wear comfortable footwear too. Wearing the right footwear is very important as far as pregnancy is concerned. You must make sure that the footwear is comfortable and your feet has enough breathing space. Do not go for too many straps as they will restrict the feet's movements. Apart from being comfortable, your sandals or shoes must have good support and must be neither tight nor loose. If it is tight, then your feet may start paining and if it is loose you may fall and hurt yourself. So make sure your foot wear is as comfortable as your bathroom slippers especially when you are pregnant.